I am not a morning person. At all. Please don’t try to have a conversation with me first thing. Not until I’ve at least consumed some caffeine. In fact, reading through my personal blog, Jenster’s Musings, I notice the themes of “must have coffee” and “mornings are lame” scattered throughout. When I first wake up I want silence. I want the only sound to be that of my brewer and my slippered feet padding across the kitchen floor, moving toward that liquid ambrosia. I want quiet. Unpleasant sounds and cognitive thought are as nails on a chalkboard to me. And just so there’s no misunderstanding here, I consider talking an unpleasant sound pre-coffee. With grown children who no longer clamber for my attention or pick on each other (except when they’re both home), I can enjoy peaceful mornings. After 27 years of marriage, my husband knows to give me my space until that first cuppa joe has had a chance to work its magic. But a peaceful environment and having peace are two completely separate things. I can be in a quiet library or next to a tranquil lake and not have peace. My soul can be in utter turmoil even though I’m in the most peaceful setting. But thankfully, the reverse is also true. I can be in the middle of a bustling Times Square and be at peace. My world can be crashing down around me, and still I can have peace. Like most everyone else, I’ve had my fair share of struggles in this life and even when things were at their worst, I still felt the otherworldly peace of Christ. Peace is a gift from God. A fruit of the Holy Spirit that is accessible when we keep our focus on Jesus. This world is not a peaceful place. We live in a time of turmoil and chaos. You can’t open the newspaper or turn on the TV without seeing evidence of terrorists and kidnappers and murderers. These events, sadly, are nothing new. We live in a broken world and since the beginning of time there have been wars and unspeakable violence. However, we can overcome this broken world. That doesn’t mean an end to the horror and hatred. I don’t believe we’ll ever see that kind of peace this side of heaven. 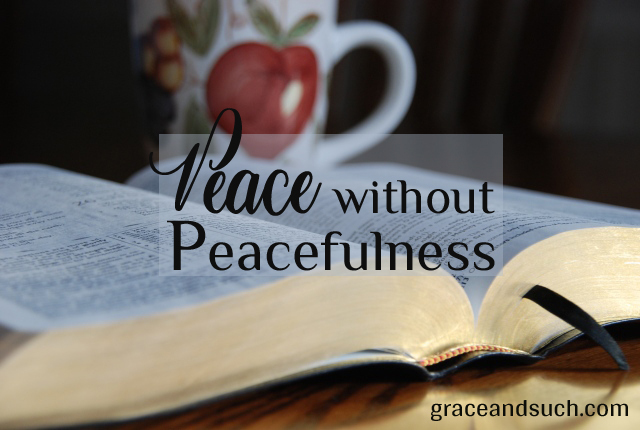 But we can tap into that supernatural peace by keeping our focus on Jesus. This world is not our home. As sad and hurtful as this place can be, there’s something so beautiful, so perfect, so peaceful waiting for us. That is ultimate peace. I’m sitting here reading your post while waiting to have my mammogram. I have not been at peace. Thank you for your words. Praying peace for you, Julie. “But we can tap into that supernatural peace by keeping our focus on Jesus.” It’s really this simple. And this complex, especially amid the siren’s wail of distraction this time of year. Peace. Heavenly Peace. Thank you, Jen, for the still, soft reminder. Good point my friend…a peaceful environment and having peace…two separate things. Thanks for sharing your thoughts on our beloved Jesus and the peace that is found in him. Peace is a tough one for me, and some close to me have noticed my struggle as of late. I’m choosing, today, to take your words to heart and focus on Jesus and his words. Praying you find peace in Jesus. Like Gretchen said, so simple yet so complex.